Call x4598 to make your reservation. Level 2 manager Howard Budd observes as technician Dan Ruggiero, and technical associate Heng Bao Zeng, inject epoxy at the gluing station into optical connectors holding optical cables that will become part of the MINERvA detector. MINERvA collaborators have a lot more to celebrate this season than the holidays. The neutrino experiment recently received construction approval from DOE and overcame a large hurdle to building the detector. "We are really excited, believe me," said Project Manager Deborah Harris. "The collaboration will be together this week for a group meeting, so that's when we'll get to celebrate." Prior to construction approval, the group completed a six-month R&D program to make the ends of 4,500 optical cables opaque while meeting fire safety requirements. The cables carry light from particle interactions in the detector to sensitive measuring devices and need protection from outside light. But traditional fire-proofing chemicals compromised the cables' performance. 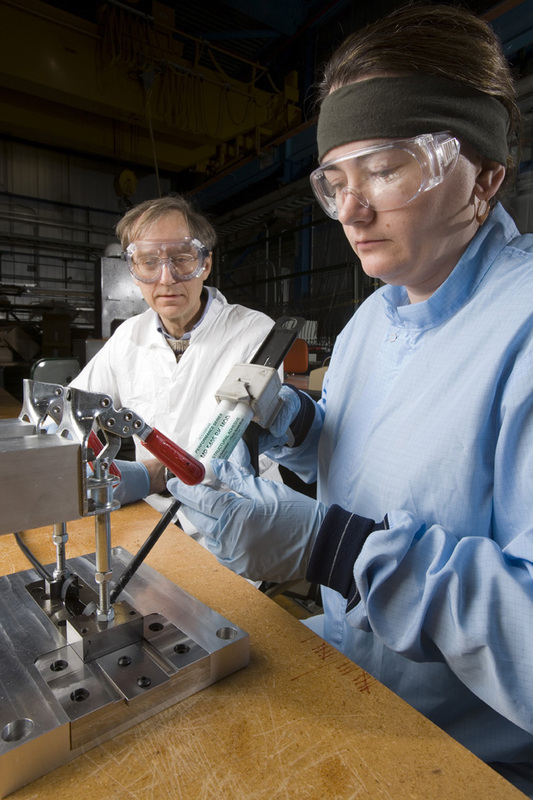 Level 2 manager Howard Budd watches as technical associate Janina Gielata puts epoxy in a boot mold at Lab G to create a light-tight cover for optical cables for the MINERvA experiment. 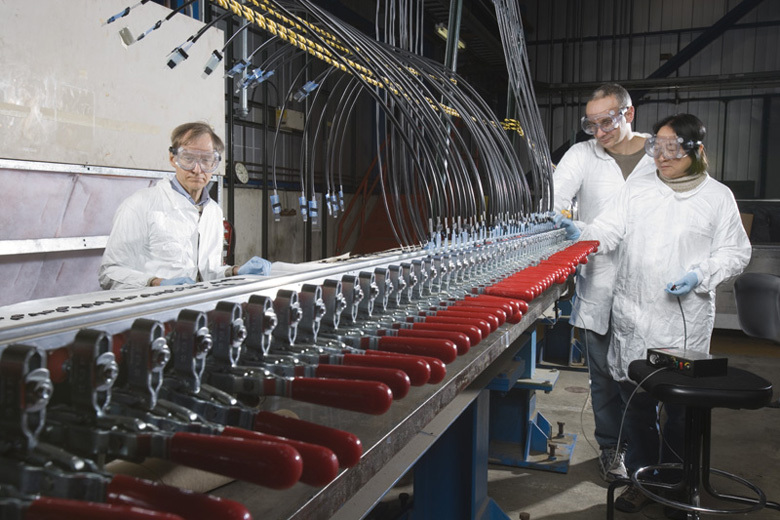 Howard Budd, level 2 manager from University of Rochester and veteran optical cable-maker for CMS and CDF, searched for an epoxy vendor that could fix the problem without introducing a new glitch. "It seems like we had months of meetings where Howard reported on flame characteristics from failed burn tests" said Kevin McFarland, experiment co-spokesperson. Finally, Budd found a rare fire-retardant paint that didn't expand when heated and a small business eager to modify its epoxy formula to suit MINERvA's needs. "It has been pretty frustrating, but we are starting to go into production," Budd said. That was perfect timing. That same month the DOE granted the 85-member collaboration Critical Decision-3 approval. The approval specifies a total project cost of $16.8 million, including $5.8 million planned for FY2008. A small portion of the project was approved in March to allow collaborating universities to purchase a few items with long fabrication times. For the rest, collaborators must wait for Congress to pass the 2008 federal budget. "CD-3 is an important milestone," said experiment co-spokesman Jorge Morfin. "It is also a direct testament to the hard work of the project manager and all the managers of the different sub-projects as well as the terrific support from the PPD and Directorate." MINERvA collaborators are half-way through building a full-scale prototype of the experiment, which will study how neutrinos interact with matter using four different kinds of nuclei. It will consist of 20 modules, essentially making a very thin detector to test design. The final detector will consist of 108 modules. Collaborators expect to test the prototype with cosmic rays by summer, and hope to start commissioning the final detector in the NuMI near detector hall by the end of 2009. CERN Director General Robert Aymar today delivered an end of year status report at the 145th meeting of Council, the Organization's governing body. Dr Aymar reported a year of excellent progress towards the goal of starting physics research at the Large Hadron Collider (LHC) in summer 2008. Council also approved a budget for CERN in 2008 that will allow consolidation of CERN's aging infrastructure to begin, along with preparations for an intensity upgrade for the LHC, by 2016. The LHC is CERN's new flagship research facility, bringing together some 9000 researchers from around the world. Approved by the CERN Council in 1996, it will begin operation in 2008 and has an expected operational lifetime of around 20 years. The experimental collaborations running the LHC's detectors, ALICE, ATLAS, CMS, LHCb, and TOTEM are poised to bring new and profound insights into the workings of our Universe. Three main ingredients are necessary for this kind of research at the frontier of knowledge - the LHC itself will accelerate and collide particles of matter, the detectors will observe the collisions, and a vast global computing infrastructure, the Worldwide LHC Computing Grid, is being put in place to analyze the resulting data. In 2007, good progress has been made on all fronts. 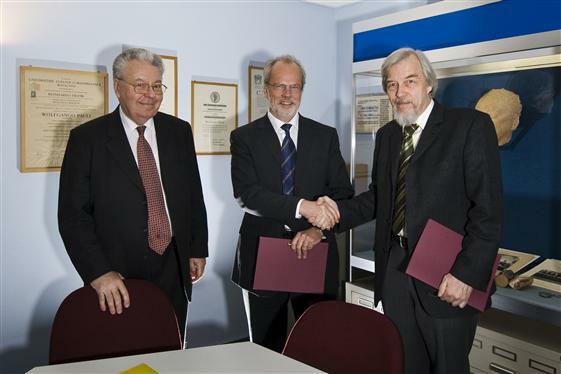 From left to right: Dr Robert Aymar, current CERN Director General, Professor Torsten �kesson, President of CERN Council, and Professor Rolf-Dieter Heuer, CERN's next Director General. CERN Council today appointed Professor Rolf-Dieter Heuer to succeed Dr Robert Aymar as CERN's Director General. 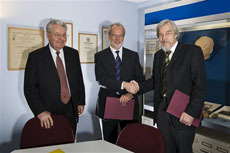 Professor Heuer will serve a five-year term, taking office on 1 January 2009. His mandate will cover the early years of operation and first scientific results from the Laboratory's new flagship research facility, the Large Hadron Collider (LHC). The LHC is scheduled to begin operation in summer 2008. Currently Research Director for particle and astroparticle physics at Germany's DESY laboratory in Hamburg, a post that he took up in 2004, Professor Heuer is no stranger to CERN. From 1984 to 1998, he was a staff member at the Laboratory, working for the OPAL collaboration at the Large Electron Positron collider (LEP) research facility. From 1994 to 1998, he was the collaboration's spokesman. "This is a very exciting time for particle physics," said Professor Heuer. "To become CERN's Director General for the early years of LHC operation is a great honour, a great challenge, and probably the best job in physics research today. I'm looking forward to working with CERN's community of personnel and researchers from around the world as we embark on this great adventure." The CMS Tracker at CERN traveled Wednesday night from the Meyrin site to Point 5. 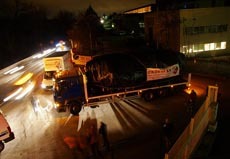 It traveled at night to minimize traffic impact. The Tracker was lowered into the cavern Thursday and will be installed into CMS on Saturday. Image courtesy of Michael Hoch, Adventure Art. Monthly Leave Sheets are due in Payroll by 10 a.m. on Dec.14, 2007. For Monthly employees who are on FTL, the Monday due dates remain. That is, your due dates are Dec. 17, Dec. 24, and Dec. 31. Monthly employees will be paid on Dec. 21, 2007. Weekly time sheets for the week ending Dec. 23 are due in Payroll by 10 a.m. on Dec. 17. Revisions for week ending Dec. 16 are due in Payroll by 9 a.m. on Dec. 17. Weekly employees pay dates for the weeks ending Dec. 16 and Dec. 23 will be Dec. 21. Fermilab will host a second users' workshop Jan. 25-26 to discuss the physics of Project X. The workshop will focus on the details of the experiments that might be proposed to take advantage of a high-intensity proton source, their physics impact and the development of the overall experimental strategy. Information about the workshop, working groups and ongoing efforts is available online. Ground floor maintenance work will continue through Friday, Dec. 14, in Wilson Hall. Painting, patching and re-carpeting of selected high-traffic public areas will be performed through Friday between 4 p.m. and midnight. Please do not disturb the repairs or equipment. The EAP Office will be closed today. Regular office hours will resume the week of Dec. 17. The EAP is available 24/7 by calling 1-800-843-1327 or online at www.vmceap.com. Monday, Dec. 17, 1:30 - 3 p.m.
Tuesday, Dec. 18, 9 - 10:30 a.m.
Wednesday, Dec. 19, 9 - 10:30 a.m. The deadline for applying for the tuition remission program at The University of Chicago for the Winter 2008 quarter is today. More information and enrollment forms. Contact Nicole Gee at x3697 with any questions.